New Look help people express themselves, feel good and look great. The experienced staff inspire an accessable fashion experience. 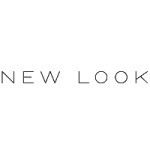 New Look stocks a full range of ladies fashion clothes and accessories, footwear and also childrenswear age 9 - 15 years.